Southern peas, often also called cowpeas or black eyed peas, are tasty legumes that are grown both as animal forage and for human consumption, usually dried. Particularly in Africa, they are an extremely popular and important crop. Because of this, it can be devastating when southern pea seedlings fall ill. Keep reading to learn more about recognizing diseases of young cowpeas and how to treat cowpea seedling diseases. The two most common young southern pea problems are root rot and damping off. These problems can both be caused by three different pathogens: Fusarium, Pythium, and Rhizoctonia. If the disease hits the seeds before they germinate, they will likely never break through the soil. If dug up, the seeds might have soil clumped to them by very thin threads of fungus. If the seedlings do emerge, they often wither, fall over, and eventually die. The stems near the soil line will be waterlogged and girdled. If dug up, the roots will appear stunted and blackened. The fungi that cause root rot and damping off of southern peas thrive in cool, moist environments, and when the soil contains large amounts of undecomposed vegetation. This means you can usually avoid this southern pea seedling disease by planting your seeds later in the spring, when the soil has sufficiently warmed up, and by avoiding poorly draining, compacted soil. Avoid planting seeds too closely together. If you see symptoms of root rot or damping off, remove the affected plants and apply fungicide to the rest. Another southern pea seedling disease is mosaic virus. 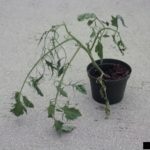 Though it may not show symptoms immediately, a plant infected young with mosaic virus may become sterile and never produce pods later in life. The best way to avoid mosaic virus is to plant only resistant varieties of cowpea.